(PhysOrg.com) -- An international team of researchers succeeded at the Max Planck Institute of Quantum Optics to control and monitor strongly accelerated electrons from nano-spheres with extremely short and intense laser pulses. (Nature Physics, 24. April 2011). When intense laser light interacts with electrons in nanoparticles that consist of many million individual atoms, these electrons can be released and strongly accelerated. 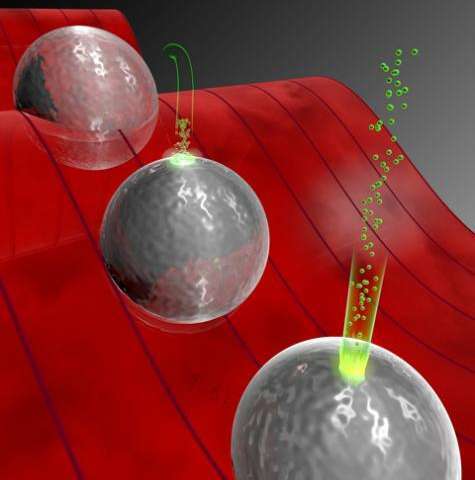 Such an effect in nano-spheres of silica was recently observed by an international team of researchers in the Laboratory for Attosecond Physics (LAP) at the Max Planck Institute of Quantum Optics. The researchers report how strong electrical fields (near-fields) build up in the vicinity of the nanoparticles and release electrons. Driven by the near-fields and collective interactions of the charges resulting from ionization by the laser light, the released electrons are accelerated, such that they can by far exceed the limits in acceleration that were observed so far for single atoms. The exact movement of the electrons can be precisely controlled via the electric field of the laser light. The new insights into this light-controlled process can help to generate energetic extreme ultraviolet (XUV) radiation. The experiments and their theoretical modeling, which are described by the scientists in the journal Nature Physics, open up new perspectives for the development of ultrafast, light-controlled nano-electronics, which could potentially operate up to one million times faster than current electronics. Electron acceleration in a laser field is similar to a short rally in a ping pongmatch: a serve, a return and a smash securing the point. A similar scenario occurs when electrons in nanoparticles are hit by light pulses. An international team, led by three German groups including Prof. Matthias Kling from the Laboratory for Attosecond Physics (LAP) at the Max Planck Institute of Quantum Optics in Garching and the Ludwig-Maximilian University Munich, Prof. Eckart Rühl from the Free University of Berlin and Prof. Thomas Fennel from the University of Rostock, was now successful in observing the mechanisms and aftermath of such a ping pong play of electrons in nanoparticles interacting with strong laser light-fields. The researchers illuminated silica nanoparticles with a size of around 100 nm with very intense light pulses, lasting around five femtoseconds (one femtosecond is a millionth of a billionth of a second). Such short laser pulses consist of only a few wave cycles. The nanoparticles contained around 50 million atoms each. The electrons are ionized within a fraction of a femtosecond and accelerated by the electric field of the remaining laser pulse. After travelling less than one nanometer away from the surface of the nano-spheres, some of the electrons can be returned to the surface by the laser field to the surface, where they were smashed right back (such as the ping pong ball being hit by the paddle). The resulting energy gain of the electrons can reach very high values. In the experiment electron energies of ca. 60 times the energy of a 700 nm wavelength laser photon (in the red spectral region of light) have been found. For the first time, the researchers could observe and record the direct elastic recollision phenomenon from a nanosystem in detail. The scientists used polarized light for their experiments. With polarized light, the light waves are oscillating only along one axis and not, as with normal light, in all directions. 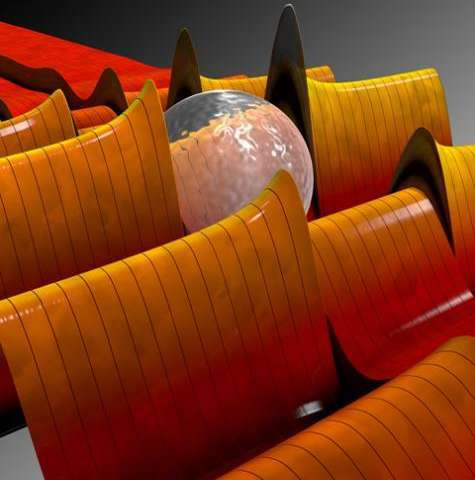 Intense radiation pulses can deform or destroy nanoparticles. We have thus prepared the nanoparticles in a beam, such that fresh nanoparticles were used for every laser pulse. This was of paramount importance for the observation of the highly energetic electrons., explains Eckart Rühl. The accelerated electrons left the atoms with different directions and different energies. The flight trajectories were recorded by the scientists in a three-dimensional picture, which they used to determine the energies and emission directions of the electrons. The electrons were not only accelerated by the laser-induced near-field, which by itself was already stronger than the laser field, but also by the interactions with other electrons, which were released from the nanoparticles, describes Matthias Kling about the experiment. Finally, the positive charging of the nanoparticle-surface also plays a role. Since all contributions add up, the energy of the electrons can be very high. The process is complex, but shows that there is much to explore in the interaction of nanoparticles with strong laser fields, adds Kling.